In 2010 the Starkville Foundation For Public Education created the Paul Cuicche Innovative Educator Award in honor of Dr. Paul Cuicchi, who taught at Starkville High School for 33 years. This award seeks to celebrate those educators who inspire their students to become lifelong learners and active participants in the world around them. Nominations are accepted each year from current and former students, parents of students, fellow teachers and administrators within the school district. Dr. Jessica Tegt is an educator who created her own curriculum and whose very position and role in the SOSD came about as a result of her individual creativity, persistence and innovation. 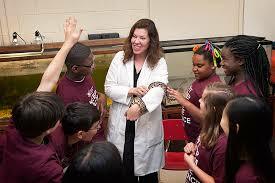 In 2008, Dr. Jessica Tegt , a STEM educator and an Assistant Research Professor at MSU for the Office of Research and Economic Development under Educational Initiatives began the development of science curricula and programing that has grown into multifaceted, rigorous, student-centered learning initiatives that impact our students from K-12. Her brainchild includes the YES! Program or Youth Environmental Science Program enjoyed by our elementary and middle school students, the Starkville Science Club at HWS, Science Olympiad Teams for our middle school and high school students, the Reading is Our Nature program, and the YES! Summer camps. One measurable impact of these efforts revealed itself in improved fifth grade state science test scores at Henderson Ward Stewart BY 23.8 points between 2012-2014, which were the early years of the YES Science program. The more subjective impact of these programs is the germination of a love of learning for science, technology, engineering and math that she and her amazing team of educators has fostered in the children of our school district. Read More About Dr. Cuicchi.